Have you ever asked where Ikea gets its inspiration for its furniture? Anthony looked at the question and found out. Here are five Ikea furniture pieces and the inspiration behind them. Pure, simple and elegant, the # 60 stool was designed in 1933 by Alvar Aalto. Imitated again and again, the original model in Finnish birch remains today an industrial design icon. Here, the Ikea design borrows heavily from the early 20th century, with birch veneer parts assembled together with screws. Almost identical at first glance, the two versions of the iconic stool are probably a perfect item for your living room or bedroom, whether you are a purist or student. Made for the first time in 1933 by the architect, urban planner and designer Alvar Aalto, the chair # 401 from its very conception pushes the limits of wood. For example, the frame of the # 401 flexes slightly under weight, but it is this give in the material that increases the comfort of the chair. It is through the details we see the experimental spirit of Aalto, who influenced other designers like Ray and Charles Eames. What about the imitation version of the piece by Ikea? 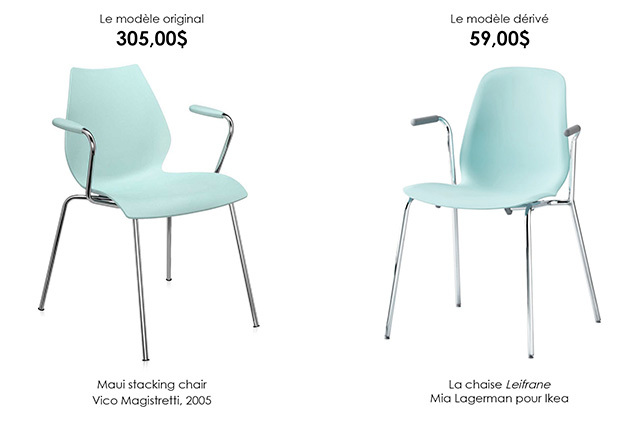 At first glance, the Poäng Ikea Series and the # 40 chair seem almost identical. It is by paying attention to the assemblage of the different parts of the item (many more in the case of Ikea) that we notice dissimilarity. 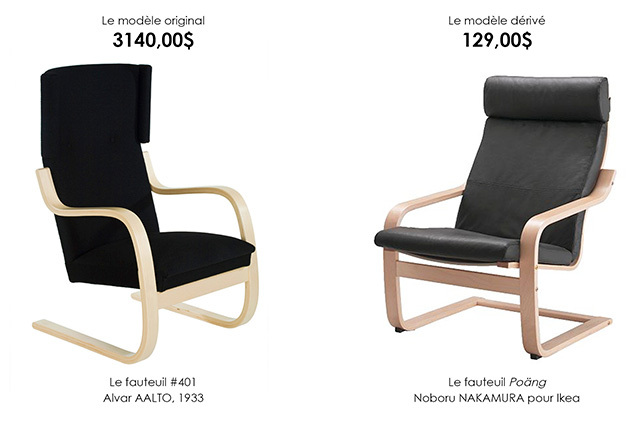 Another obvious difference is the price, with the Alvar AALTO chair costing considerably higher. 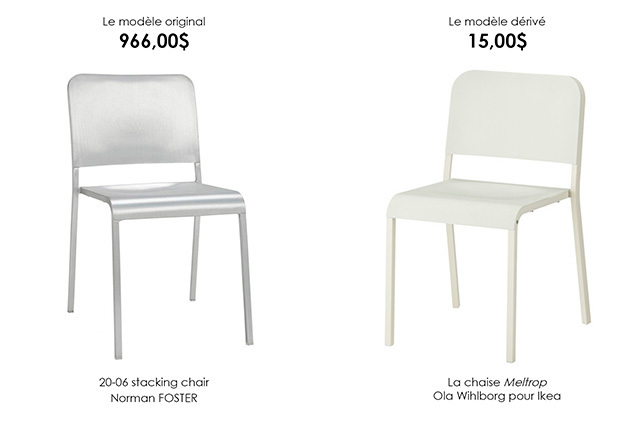 With this difference in price, it comes as no surprise that the # 401 chair is made ​​from better materials. Designed by British architect Norman Foster for the Emeco company, the 20-06 stackable chair is arguably the most accurately imitated design by Ikea. The story behind the chair is, nevertheless, worth knowing. In fact, the chair was created in tribute to the Navy Emeco, a chair originally designed for the US Navy. It was a chair that was intended for the decks of battleships and could survive sea air and a torpedo blast to the side of the ship, if need be. 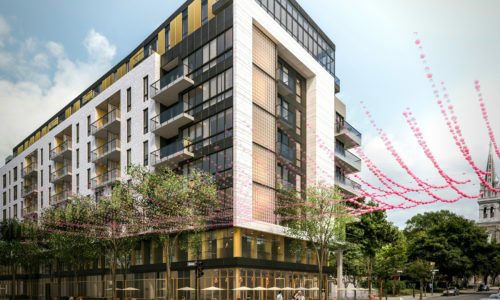 In 2005, Emeco began a lawsuit against Ikea, given their obvious replication. 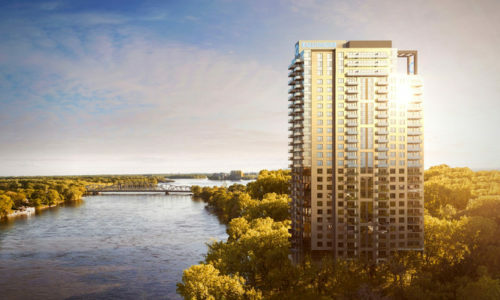 Finally, the lawsuit was settled to the satisfaction of both sides. So, what are the differences? That’s easy: the 20-06 chair is handmade in 77 steps from 80% recycled metals and is guaranteed for life for an approximate sum of $ 966.00. The chair in plastic and metal produced by Ikea is available for only $ 15.00 … and cannot be guaranteed for life, let alone withstand sea air and torpedo blasts! Perfect for offices, restaurants, public waiting areas and, of course, your kitchen, the chair, Vico Magistretti, is very versatile. As much as Ikea offers a variety of colours, Kartell (distributor of the original model) offers more. (2 at Ikea versus 11 at Kartell ) Ikea offers modifications available for the chair. For example, there is a version without armrests. In their defense, Kartell also offers some variants such a model on wheels or with padded backrest. 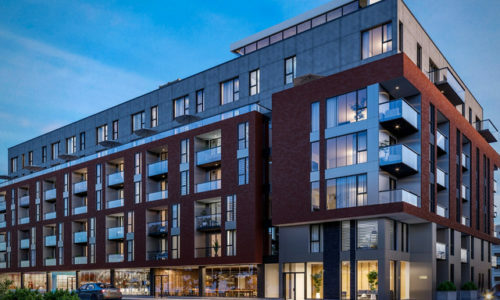 With a quite considerable difference in price, however, it’s up to the customer, to determine which one is more appealing. We find here a clear case of inspiration on the part of Ikea, rather than an obvious imitation. 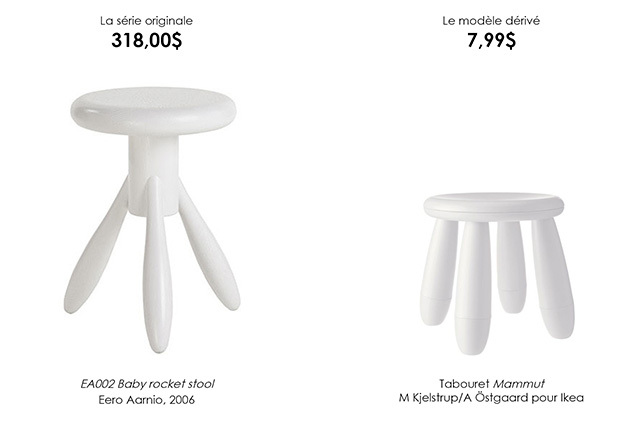 On one side: The Rocket stool and on the other, the Mammut. It’s easy to identify the model owned by Ikea. 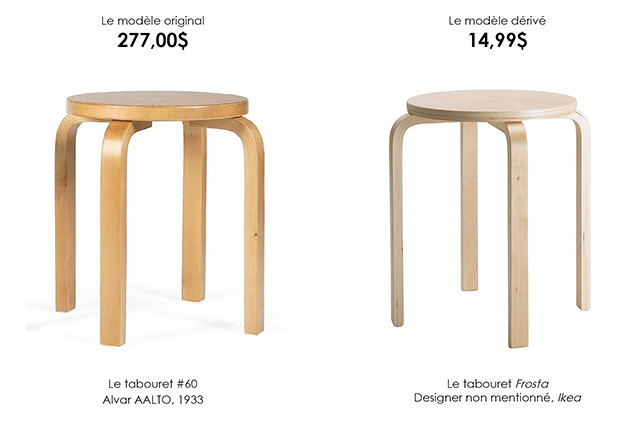 In addition to the difference in price, we notice that the Ikea stool is plastic rather than wood. However, despite everything, the childish look is similar. What is behind the look? The Finnish designer, Aarnio, was recognized for his achievements in the strong design, stimulating the imagination of its users. This is also why several models of Aarnio are found today in various prestigious museums, movies, video clips and fashion shows.